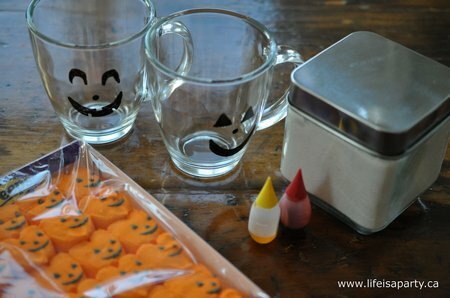 This is a fun and easy treat for Halloween, especially after trick or treating on a cold dark night. It’s just the thing to warm up your little ones. I started with two plain glass mugs from the dollar store. 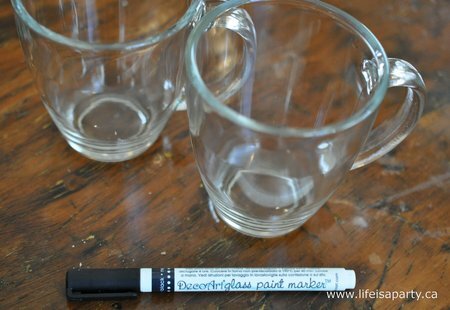 I used the Decor Art Glass Marker -that I had from my Crate and Barrel knock-off plates, see them here. 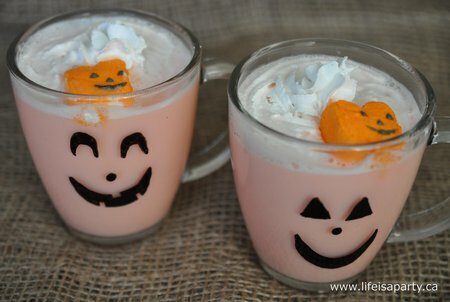 I drew a simple jack-o-lantern face on the mugs. Don’t worry if you don’t like your first attempt, you can just wipe it off and try again until your happy with your design, or get the kids to design their own. After a sit a few hours you bake it in the oven -as per the package instructions. Afterward you’re left with a permenant, wash proof jack-o-lantern mug. Perfect for some orange hot chocolate. 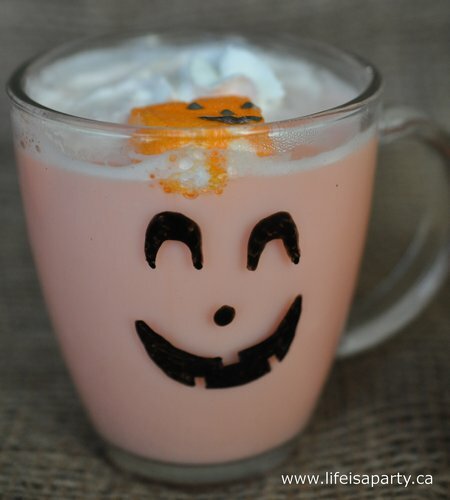 I had so much fun with the pink hot chocolate for Valentine’s Day, that I tucked the idea away for Halloween. I started out with some white hot chocolate. I got mine at the Bulk Barn. Then I added a few drops of yellow and red food colouring to make orange. That’s it, easy peasy. I topped them off with a little whipped cream, and some fun jack-0-lantern marshmallow peeps. The kids loved it. 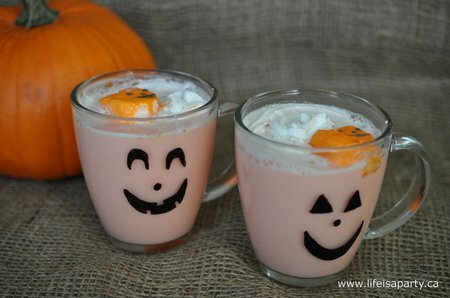 With orange hot chocolate in jack-on-lantern mugs, life really is a party! This post is linked up at Lil’ Luna, 36th Avenue, The Shabby Creek Cottage, Savvy Southern Style, The Shabby Nest, Whipperberry, Tatertots and Jello, Tidy Mom, Craftionary, and Craftberry Bush.